In the Intention Stage, the change agents and senior managers weigh the strategies and alternatives available to move the needed changes forward in the organization. They decide upon a specific course of action that will bring about change. They formulate a vision for the organization. The Intention Stage ends with the selection of an approach for moving the organization through to make the changes needed. The options in change management strategies and tactics are also considered. Strategies that will accomplish the approach are also determined. Up to this point, you've done a lot of thoughtful consideration of the problems your organization faces. You've identified the need to make changes. And, you've considered the options that you have for the change and making the change. If you're following the recommended course of action thus far, you have also assessed the readiness and the willingness of the employees in your organization to pursue the course of action and the needed changes. In the Intentions Stage, change agents, senior leaders, and managers must do all of the following to ensure success. Assess the impact of suggested solutions and improvements on the organization. If you are using an external consultant, assure that the organization's goals and needs are clearly understood and agreed upon in a written contract. Make sure that the appropriate people are involved from across the organization and that their input is considered, and when sensible, implemented. Involve as many people as appropriate and possible so that you are developing buy-in and support on the front end. This is far superior to dragging your employees kicking and screaming after the changes have been put in place—kicking and screaming isn't pretty and it can undermine the chances of your changes succeeding. And, employee resistance can undermine everything because resistance can even reach a point where employees are actively sabotaging the effectiveness of the changes. Consider additional strategies and methods for initiation and implementation to further reduce employee resistance to change. Examine the goals and direction of critical people and work units to assess the degree of conflict likely to arise and result from the selected solutions and strategies to accomplish it. Explore organization development and training options to assist with the next three stages of change. Inform employees about the selection process, the alternatives considered, why alternative solutions were rejected, and the rationale for deciding on the selected approach. The more you communicate with employees before you implement the changes, the more involved and committed they are likely to feel and act. You need to avoid the appearance and mistake of doing something to them—instead, create changes with them. Make sure that employees feel compensated, rewarded, and recognized for the extra time and effort that they expended in the evaluation process. You need to pay attention to this at every stage of a change process. Make sure that the senior members of the management team are onboard and supporting the need to change. In fact, this is a very important group to have by your side as you implement any changes in your organization. If they don't support the changes, they will undermine and may even sabotage your efforts to move the needed changes forward. They have too much influence over too many people if they are not on your change team. 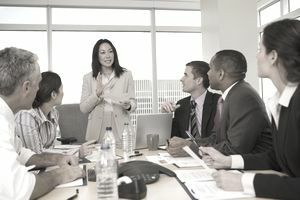 As many executives implementing change in their organizations have noted, their biggest mistake was allowing the members of the senior team to undermine their change efforts for way too long before firing them. If they don't quickly come on board, they won't. You can trust this fact. Greg Scheesele, when leading a change effort at Pall Gelman Sciences Corporation said, "I gave my senior team about eighteen months to get on board. It was my biggest mistake. I should have known within 30-60 days who would support our changes." Decide which of the suggested solutions will best address the problems you have identified. Create and broadly share an energizing, inspiring vision of the future state to create widespread support for the change. Decide where and when to start. Determine whether you will be more successful starting in a single work unit or department to run a pilot or if you'd be better off diving right in and involving the whole organization. See the six stages in change management.